Asthma affects as many as four hundred thousand people in this country alone, and Ireland has one of the highest rates of childhood asthma in the world. The month of May marks the beginning of the peak season for asthma and allergy sufferers, and has therefore been designated Asthma and Allergy Awareness Month. The tendency to develop asthma is genetic, but the disease itself is usually precipitated by environmental influences. The environment we live in and the stressors we are exposed to have changed a great deal in recent years, and this has caused more and more people to develop the condition. Factors which can adversely affect the development of the immune system in early childhood, such as excessive use of antibacterial cleaning products, frequent courses of antibiotics, and vaccinations given when the child is unwell, may increase the risk of asthma in later life. Other triggering factors include anxiety, infection, allergies, pollution, frequent use of certain drugs such as paracetamol, poor diet and excessive salt intake. Asthma sufferers develop hypersensitivity of the lungs, which causes spasmodic constriction of the bronchi and production of excess mucus. This leads to a sense of constriction in the lungs with wheezing and coughing. Research has revealed that many people with asthma find it difficult to control their symptoms. More than half of all sufferers regularly experience problems during the day due to coughing, wheezing or shortness of breath, and more than a quarter suffer from sleep disturbance. More than 40% of children with asthma regularly have to take time off school and 20% of adults miss days at work due to the illness. However with the right treatment it is possible to effectively control the symptoms of asthma. Medical herbalists take a holistic approach to treatment and provide individually tailored prescriptions, which combine a number of different herbs. For example, antispasmodic and broncho-dilating herbs such as lobelia help to reduce constriction and wheezing, anticatarrhal and expectorant herbs such as elecampane deal with excess mucus production, while antimicrobial herbs such as thyme help to treat infections and reduce the need for antibiotics. Coughing can be reduced with herbs such as coltsfoot, and antiallergy herbs such as nettle are also helpful. If you suffer from asthma, it is important to avoid foods which commonly cause allergic reactions, such as dairy products, wheat, eggs, and nuts. It is also helpful to avoid foods that are high in histamine, such as tomatoes, red-skinned berries, citrus fruits, fermented foods and preserved meats. However, it is important to eat plenty of other fresh fruits and vegetables since studies have shown that high antioxidant diets can reduce the frequency and severity of asthma and allergy symptoms. 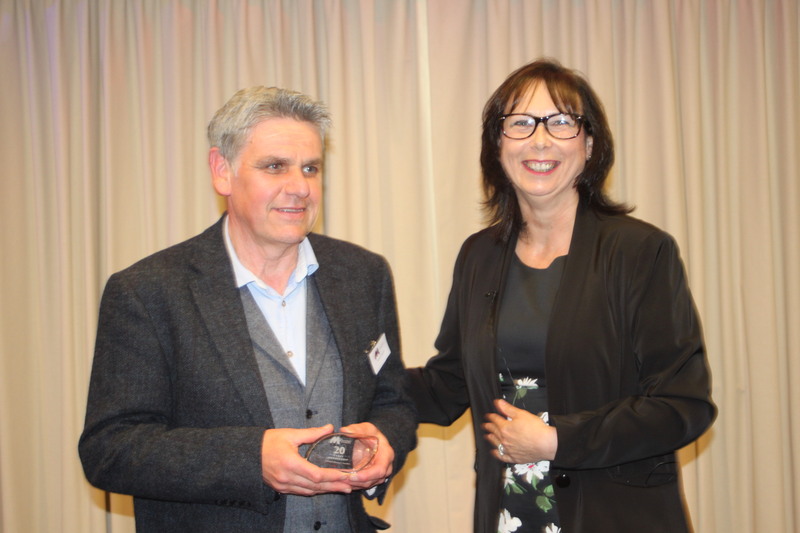 Brian Livingston, Chiropractor at The Lismore Clinic, has received an award for 20 years service, by the McTimony Chiropractic Association. Brian trained at the McTimoney College of Chiropractic in Oxford, and worked in a very busy clinic in the UK for 9 years. On moving to Ireland in 2004, he spent a couple of years working at The Lismore Holistic Centre, before joining the team at The Lismore Clinic in 2006. Since then he has used his vast knowledge and extensive experience in the treatment of musculoskeletal problems, to help many people, both from the local area and those who travel from a miles away to see him, based on his excellent reputation. McTimoney chiropractic was developed by a chiropractor called John McTimoney in the 1950s. He pioneered a new technique for adjusting the bones which consists of an extremely light, fast and usually painless movement. The adjustment encourages the bone to return to its correct alignment without forcing it or stressing the joint.Like osteopathy and other forms of chiropractic, McTimony helps to correct misalignment of the joints due to injuries, strenuous exercise, overuse of certain joints or muscles, poor posture, or degenerative diseases such as arthritis. However, there is no violent manipulation involved and the treatment is suitable for people of all ages, including the elderly and young children. Joints which move out of their correct position will often cause the surrounding muscles to go into spasm in an attempt to protect the joint against further damage, and to hold the body in the most ergonomic position possible. A shift in one part of the body will usually lead to a compensatory shift elsewhere in order to maintain balance. For example, a tilted pelvis will often result in a curve in the upper spine, while a deviation of the knee joint will cause pressure and pain in the ankle joint. The muscles around the site of compensation are also likely to tense up and this too can cause problems.Muscles which are in spasm become irritated and inflamed, leading to pain and stiffness. Either the muscles or the misaligned bones themselves may also pinch the nerves or blood vessels in the surrounding areas, leading to problems such as carpal tunnel syndrome, sciatica and headaches. McTimony chiropractic can help to relieve problems affecting the muscles and other soft tissues around the joints, as well as misalignment of the bones themselves.Orthodox treatment for musculoskeletal problems such as arthritis and injuries usually consists of analgesic and anti-inflammatory drugs. These can be very helpful for managing severe pain in the short term. However, they do not address the underlying cause of the pain, may be associated with side effects such as gastritis and stomach ulcers if used long term. In severe cases, surgery may be offered. However, most people consider this to be a last resort. McTimony chiropractic can help to reduce the need for analgesic and anti-inflammatory drugs, and in some cases surgery may be avoided altogether. Brian Livingston, chiropractor at The Lismore Clinic says that, “the number of treatments needed varies depending on the nature and duration of the problem. A recent injury will generally heal more quickly than a long-standing problem, but typically people need between two and six sessions.” The most common problems that Brian treats on a regular basis include back, neck and joint pain, injuries, tension headaches and sciatica. “I also use other techniques including massage to relax the muscles and specific exercises to help maintain the adjustment,” he adds.